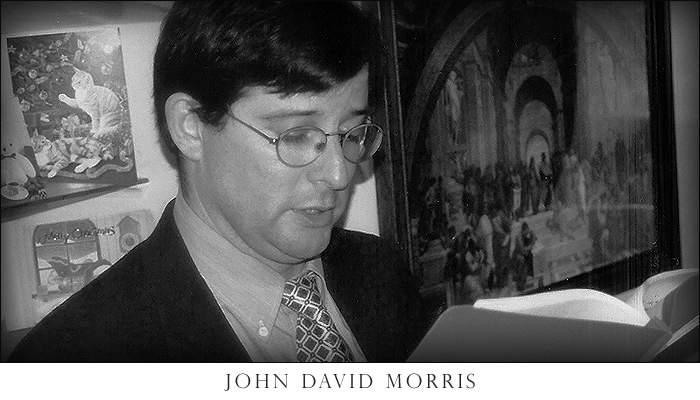 John David Morris (b. June 7, 1960), friend, colleague, and 26 year long member and organizer with the ICLC, died June 16, 2008. Born in Yosemite National Park to Hal and Barbara Morris, John exhibited early on a precocious curiosity—a curiosity that caused as much alarm in some circles as it did excitement in others. He attended Groton, a private boarding school in Connecticut for three years, completing his high school education at Santa Cruz, California, graduating ahead of his class in 1977. The Bard tells us that the world is a stage and history, life, but the unfolding of a drama, with each potentially immortal soul cast upon this mortal coil to write for him or herself the unique role we each shall play in the unfolding of creation. John’s writing of his role began with his discovery of the LaRouche movement in Seattle, WA in 1982. After high school, he spent a year at the University of California in Santa Cruz, then moved to Seattle to attend classes at the University of Washington. There he met organizers with LaRouche and decided to dedicate his life to the fight LaRouche was leading against the post-industrial, New Dark Age agenda of London and Wall Street financial elites and for a revival of the American System of Political Economy and classical culture. He instantly became a leading organizer in support of the activities of the National Democratic Policy Committee (NDPC), the political action committee launched by Lyndon LaRouche and collaborators to defend the Franklin Delano Roosevelt (FDR) tradition of statesmanship and leadership within, especially, the Democratic Party. There was a playful side to John’s character that endeared him to everyone. A photo from one of the Groton yearbooks show him with long hair and headband, arms spread wide, wearing his familiar wide grin, “surfing” on a skateboard. A family photo shows him in a light-saber duel with his nephew in the back yard. Yet, beneath the playfulness there was a profound love of truth and a passion to do the good. John loved to organize. A voracious reader since his youth, he took particular interest in those historic individuals whose commitment to universal principles established them as true patriots in there own country, and as figures to be honored by men and women of good will everywhere. Organizing, for him, was an opportunity to share his discoveries, making history come alive for his audience, be it one person on the street, a classroom full of students, or an entire nation. Of particular importance to the challenge of American and Asian relations today, is John’s work on Jose Rizal, inspirational leader of the Philippine fight for independence against Spanish colonialism. While Rizal is recognized among Philippine patriots as the founding father of their independence from Spain, John discovered that Rizal’s love of country and countrymen was no mere romantic revolutionary zeal. Rizal studied the works of Leibniz and Schiller, whose works were crucial to the success of the American Revolution, translating some into Tagalog, and adopted the universal principles espoused by them as the basis for his continuing fight for Philippine Independence. The lessons learned would then be incorporated in his organizing as a challenge to others. His last project, incomplete but soon to be posthumously completed and published, John was preparing a report on Salvador Araneta, another Philippine patriot at the center of the post independence struggle between the FDR/Hamilton tradition and the British Empire. John’s future contributions are now lost, but his memory shall serve as an inspiration for those of us who continue in the mission for which he gave the last full measure of his devotion. Shortly after his 48th birthday, John Morris died instantaneously on the evening of June 16th in an accident on the Interstate between Chicago and Detroit. John was born in Yosemite National Park and in 1963 moved with his family to Santa Cruz where he attended Westlake, Bayview, Mission Hill, and Santa Cruz High schools. John played Little and Pony League baseball. At Santa Cruz High he played on the soccer team. John was associated with Larouche advocacies and lived at various times in Seattle, Los Angeles, Pittsburgh, Philadelphia, Detroit, Chicago, and Wiesbaden, Germany. Wherever he lived his passion for reading and curiosity led him to the community library, immediately acquiring a library card. John is survived by his parents, Barbara and Hal Morris of Carmel Valley, his brother, Robert Morris of Santa Cruz, and his nephew, Alex Sklan of Calistoga. Cremation has taken place and his ashes will be scattered at a later date when the family will gather to celebrate his life. The family suggests remembrances to The Friends of the Santa Cruz Public Library through Community Foundation of Santa Cruz County 2425 Porter Street Suite 17 Soquel, CA 95073 or to the charity of your choice. Among the many friends I have had the privilege of meeting in the Movement, John was special. His untimely demise will be a sad and lamentable loss to many Filipinos who have heard him on radio, and benefited from his wise and refreshing outlook on our national hero. John skillfully presented Jose Rizal in a way that no historian known to us has ever done. Needless to say, the LYM has been so inspired that they now see Rizal not merely as a revolutionary who fought oppression, but one whose articulated principles were universal, and inspired by Schiller, Leibniz, and certainly most, if not all, of those whom we too are currently learning about. I have not had the opportunity of meeting John personally, because my short and rare visits to Leesburg could not coincide with his. But we in the Philippines developed a special affinity for him largely because of his special affinity for the Philippines. I remember asking him why he decided to write about Rizal, Sen. Claro Recto, and Salvador Araneta. His answer was that he had bumped into a Filipino writer, Sionil Jose, now based in LA, and was advised to do research on Jose Rizal. And as he did, whatever he discovered led him to dig deeper and deeper. Understanding that our country's destruction was a process, his was to educate our people to recognize the ugly hand of the Synarchists in our recent history, and their role in destroying a people most influenced by the American system of political economy. We don't know much about the good John has done for others. But we do know that in his own unique, efficient and special way, he has planted in the minds of members of the Philippine Larouche Society, and all who are influenced by us, a higher level of appreciation of the ideas which motivated our Patriots. By his example, he has shown our LYM, the value of diligent research, complemented by extraordinary insight based on universal principles. By his leadership and initiative, he has shown us what it means to promote the general welfare, to do good for the benefit of others, and to do it with humility. God bless you, John Morris. A beautiful memorial tribute was held in Chicago, celebrating the lives of Gary Genazzio and John Morris, two organizers whose lives were cut short, but whose souls are with us still. After the eulogy (below), the celebration opened with a movement from a Mozart string quartet, and right through to the concluding full chorus of Verdi's Va Pensiero, the gathering remembered our fallen heroes with poetry, song, and personal tributes. In the course of the evening Mozart joined Gary and John in smiling down upon us, as the LYM-Boomer chorus presented Beethoven's Im Arm der Liebe, and Mozart's “Ave Verum.” Songs presented included “Per la Gloria,” “Deep River,” and “Das ist der Tag des Herrn,” as well as “My Country Tis of Thee,” led by the LYM, which everyone sang. All the presentations -- an original poem, the Schiller poetry, the Shakespeare sonnets, the comments, stories, and remembrances -- reminded us of how fortunate we have been, to know and love John Morris and Gary Genazzio. The display of photos and press clippings made a deep impression on everyone, while copies of John's article on Rizal and Gary's various art works gave us a glimpse of the creative spark that drove them and inspired others. The numerous condolence messages from all over the world, elaborated the profound impact that John and Gary had, each in their own individual way, on so many around the world. Both Gary and John were endeared to almost everyone they met -- their humor, irony, kindness, goofiness, talent, and creativity was known to many in different ways. Music was very precious for both Gary and John they both loved to sing. And as we dedicated our songs to them, guests who were newer to our movement, both youth and older people, realized how integral art and culture are to the political fight we are engaged in, and that this work contributed to making John and Gary, each so unique, such beautiful souls. Gary's paintings, which graced the room, drew out a lengthy discussion of his art, his talent and his teaching, which had touched so many in various ways. Anecdotes and discussion went on for hours after the presentations, as everyone remembered our irreplaceable friends. Brief is the pain, the joy shall be eternal. We miss them dearly, but will carry on, and accomplish what they dedicated their lives to achieving. This is, indeed, a Schilleresque moment. One the one hand, that which occasions our gathering here today is a tragic loss. A loss which ignites pain and a profound sense of loss. On the other hand, our passion for the mission we shared with John and Gary, and for which they each gave the full measure of their devotion, puts us in the enviable position of resurrecting them from the ashes of their graves to continue their work on behalf of mankind. That can be a source of great comfort and great joy, even as it imposes an equally great responsibility. We mourn the loss of a son, a brother, a friend, a collaborator, a gifted artist, a gifted historian. We mourn the greater good each would have contributed to the future, had they lived. We find joy in committing ourselves to ensuring that the good bequeathed by each shall not go with them to their graves. But, shall live on through us. We remember them, not as from the past, but as part of the ever-present simultaneity of eternity where they each have earned their rightful seat, where our own true human identities reside, and where the future of civilization shall be determined. We shall therefore celebrate, even with heavy hearts.